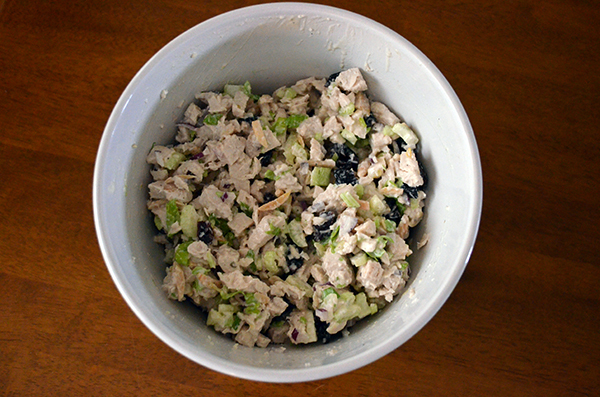 There are about as many Chicken Salad variations as there are episodes of Law and Order…approximately 1.5 million. You’ve got traditional Chicken Salad, Chicken Pasta Salad, Mexican Chicken Salad, Oriental Chicken Salad, Kitchen Sink Chicken Salad, Sweet Chicken Salad, Savory Chicken Salad, Hot Chicken Salad, and on and on and on. But really, with the right ratios you can make your own chicken salad based on what you like or what you currently have about to die in the refrigerator. So today I’m going to give you a basic formula that you can use to make any chicken salad that floats your boat. This Cooking Through Stacy’s Stash episode is brought you to by another lovely church cookbook. I got this one on a trip with my beautiful friend, Kim Anderson, when we went to a ladies retreat for the day. 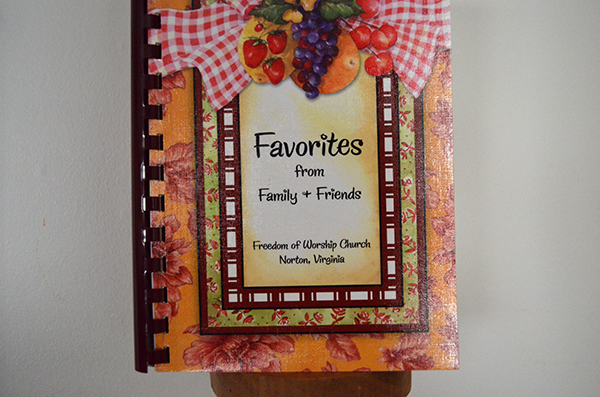 Like every other awesome church cookbook, it’s full of belly warming casseroles, cakes galore, and Velveeta. Y’all, pick you up some church cookbooks – for real. I got the idea for this when grazing through the salad section. 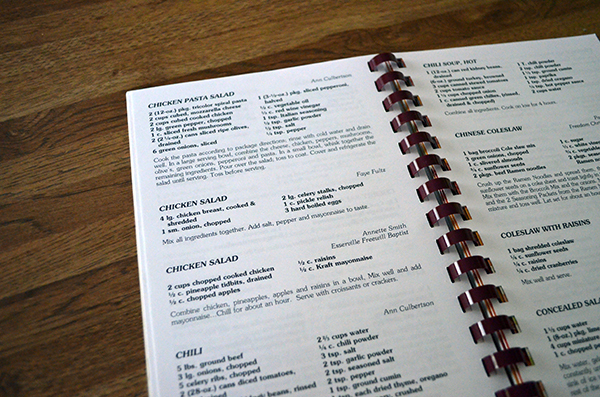 Most church cookbook salad sections should be renamed “Mayonnaise Zone.” But really, every church cookbook will have a few different chicken salad recipes – because Beulah and Mable want their own space. “They are NOT the same, as mine calls for only ½ teaspoon pepper while you use 1 teaspoon.” Bam. Get outta my pew. The basis for chicken salad is…wait for it————————chicken. Now honestly, I don’t care what kind of chicken you use. Most of the time I use leftover chicken from my Crock Pot Whole Baked Chicken. You could boil some chicken and shred it – which is what I did this particular time. But hey, I ain’t gonna lie. Sometimes Mama breaks open a can of chicken from Sam’s Club. Boom. 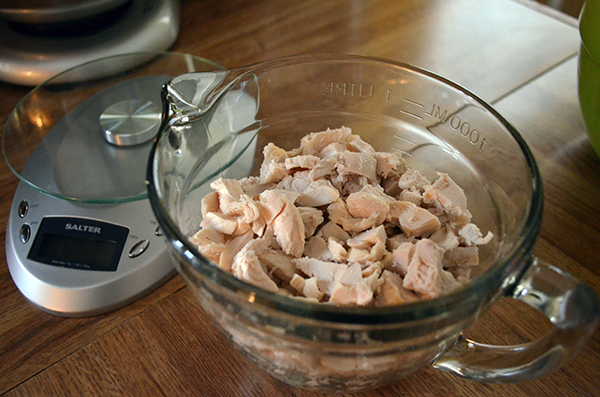 I like about 3 cups…and because I love you, I measured to find that’s about 1 ½ pounds raw chicken breast. I’m awesome and I love my kitchen scale. It doesn’t work for measuring babies though – I tried it. Then we need our veggies. Don’t be leaving the veggies out of your chicken salad. Then it’s not really a salad…it’s just MEAT AND MAYONNAISE. Leaving out the veggies takes away its salad status. 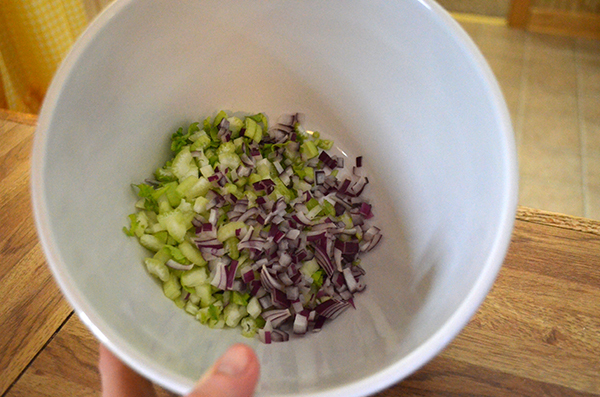 Almost all chicken salad recipes call for chopped celery and onion. I like to use red onion because I have a love affair with it. And if Barry and I both eat it, it totally cancels out the breath. And finally, we need dressing. Those are our basic components. All the other stuff is just extra and I’ll talk about that in a minute. I don’t like mayonnaise very much. Even the smell kinda makes me want to yak. I do use it in my salads…but here is my trick – I mix it with Greek yogurt. It really gives a creamy taste and reduces the mayonnaisey flavor that sometimes can happen. Too much mayo can sit like a heavy weight in the bottom of your stomach – kinda like how you feel after watching the news. So, what else do you need? Well, whatever in the world you want. Nothing is out of limits with chicken salad. I almost always add nuts to mine – and either raisins, cranberries, or dried cherries. I do not like grapes in my salad, but Barry does. So really, anything goes. Be creative now that you have a basic framework! In a bowl, combine all. Refrigerate a few hours for best flavor. Serve on bread, as the meat for your salad, or eat directly from the bowl while standing at the counter. hmmm, chicken salad sounds good for dinner (since I can’t make the maple bacon wrapped chicken tonight). I’ve got celery and onions and chicken…time to go through the rest of the cupboard! 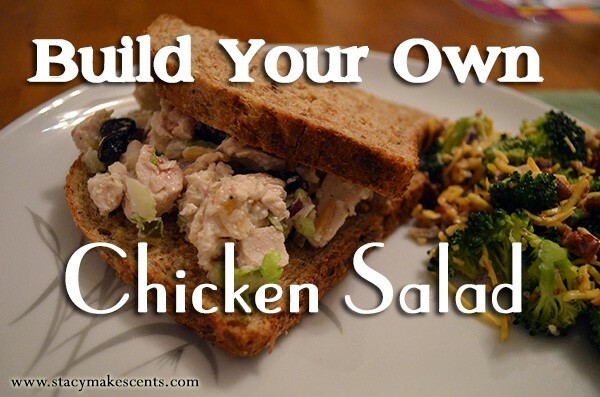 What a fun idea, I love chicken salad. I love chicken salad, but I can be rather picky about them. This is perfect for me! Thanks for linking to the In and Out of the Kitchen Link Party. Hope to see you next week. LOVE those church cookbooks! Aren’t they just the best? Great recipe – and I love the options! Funny you posted this, I have just recently had a desire to make chicken salad but had no idea how to make it. I looked at a bunch of recipes, but I’m very particular about my chicken salad, so it’s nice to see the basics. Thanks for the post. I linked it in a comment a little bit down…or up. LOL Somewhere on here. 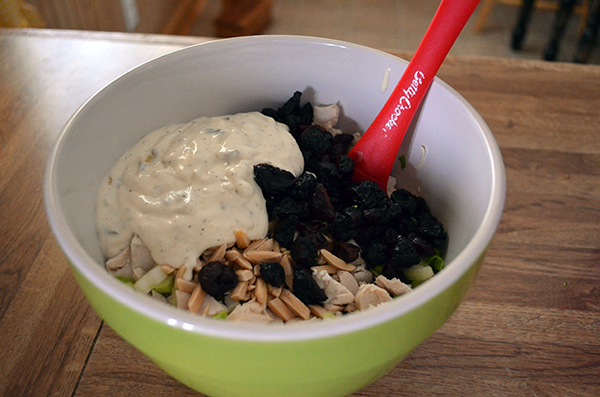 I haven’t had Chicken Salad in forever… I may have to give this a go sometime! Thanks for the add – in ideas Stacy! We eat chicken and tuna salad a lot at our house and I am always looking for new ways to serve it. I personally use plain greek yogurt a lot as a binder mixed with a spoon full of mayo .You can even make the yogurt thicker by pre – straining it through a couple of coffee filters. We use part mayo, part Greek yogurt as well and my kids think that a little garlic powder makes it. Go bacon! I absolutely love chicken salad and tuna salad. I was wondering why all the recipes call for boiled eggs? I made up my own version and never used eggs until I started looking at other recipes. I found the ingredient that really enhances the sandwich is lemon pepper. It really makes the difference in taste. I liked the Arby’s chicken salad sandwich which is very pricey and decided to make my own version. I added to the chicken, onion, celery, grapes, apples, walnuts, homemade mayonnaise and lemon pepper on toasted bread. I also ate one at a local restaurant and they used toasted raisin cinnamon bread that was incredible. I am fairly new to your posts, Stacey, and love your blogs and website!